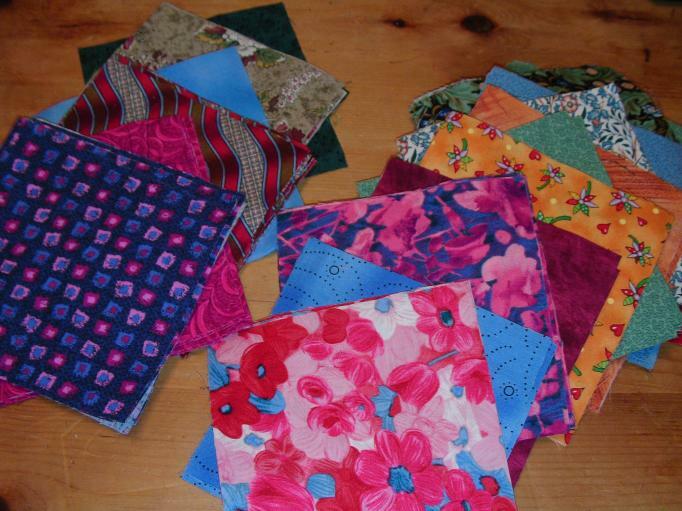 Last week, I cut lots of 5-inch squares from stash fabrics. I also found a box full of 5-inch charms that I started collecting years ago. This week I am sewing them into Puss in the Corner blocks, which is a quick and easy pattern. 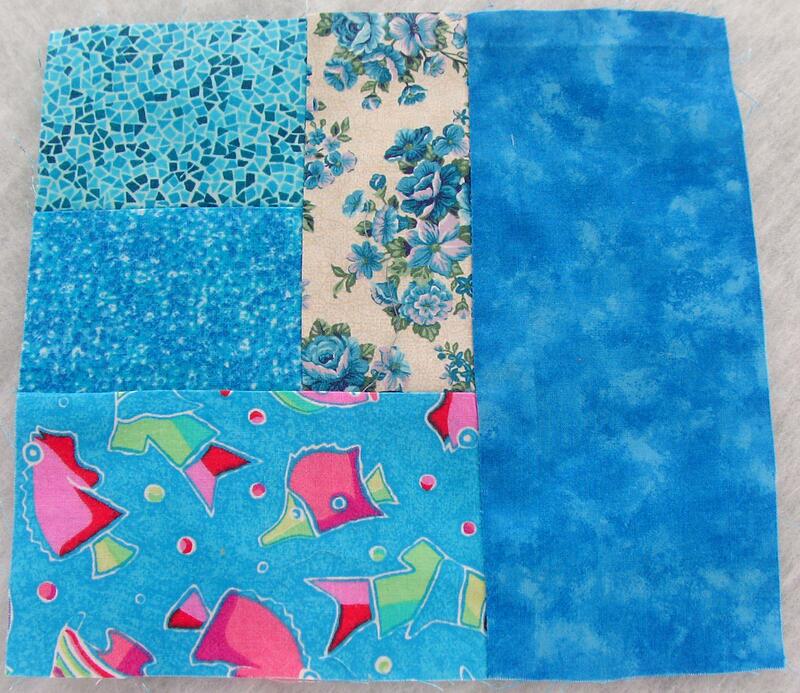 Each block uses four 5-inch squares. Since I am using 5-inch squares, the blocks are coming out at 9 inches unfinished, which yields an 8 1/2-inch finished block. That’s an awkward size to use, so I have trimmed off 1/4 inch all the way around to end up with 8 1/2 inches unfinished, or 8 inches finished. I don’t like wasting even that tiny bit of fabric because it will eventually add up to a lot, so next time I’ll try to be more exact with my maths. 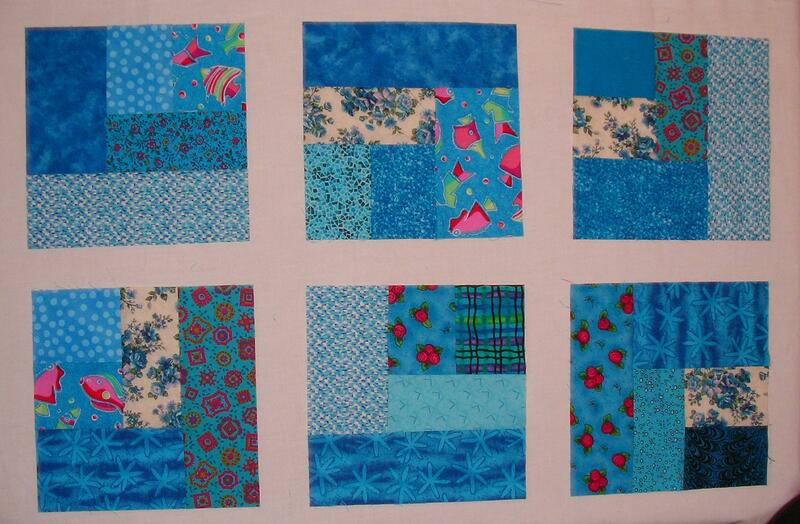 In the meantime, however, I’ll have some pretty blocks for my HeartStrings projects. I think it would also be fun to make these blocks in an all-scrappy version, using 2 or 2 1/2 inch strips from my scrap bins. Quilting Arts Forum and Quiltzine both have free patterns online for the Puss in the Corner block. 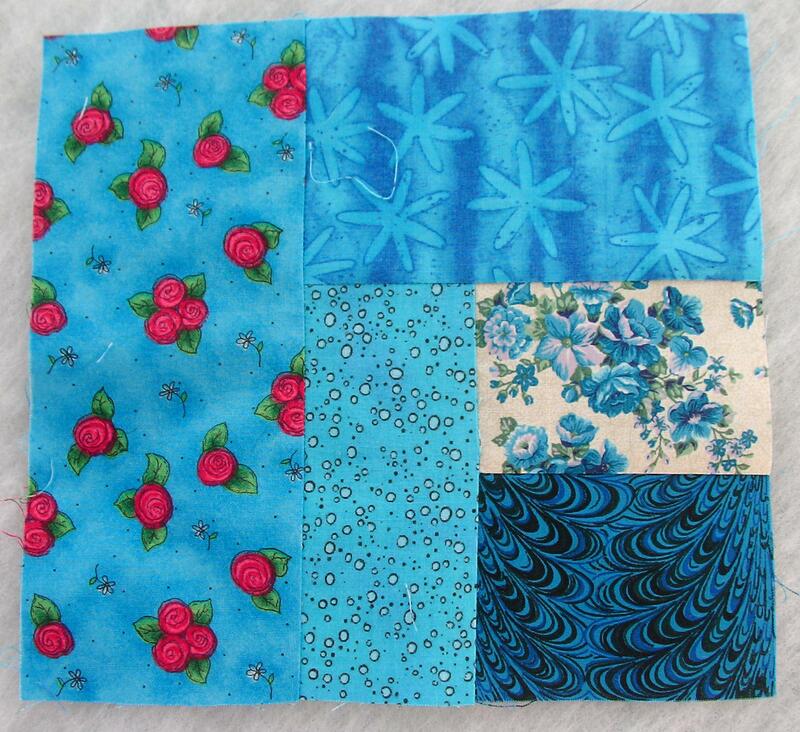 I’ve been admiring this pretty 9-patch quilt at Crazy Mom Quilts blog for a while now. 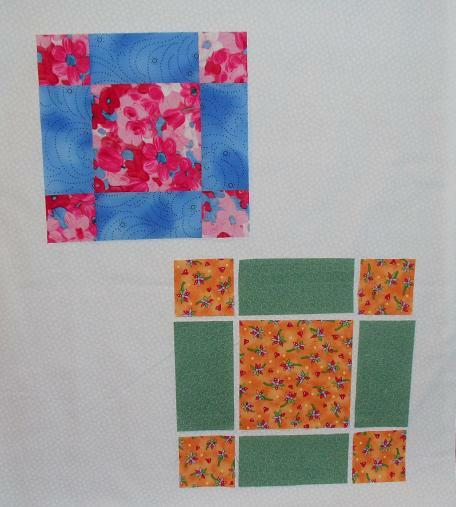 I love the white sashings, so crisp and neat-looking, with her colourful 9-patch blocks. And it’s very inspirational! So, here is my version of that look with my turquoise blocks. They aren’t sewed into the sashings yet — the blocks are only laid out on a small piece of white muslin to get the effect and give me an idea of how they will look. I think it’s exactly what I want. I will need to buy a couple of yards of snow white muslin to finish this project — but I haven’t bought any fabric yet! I am still being good for my last Stash Report of 2009. But when 2010 comes…well, maybe I will need a little shopping trip — or two! 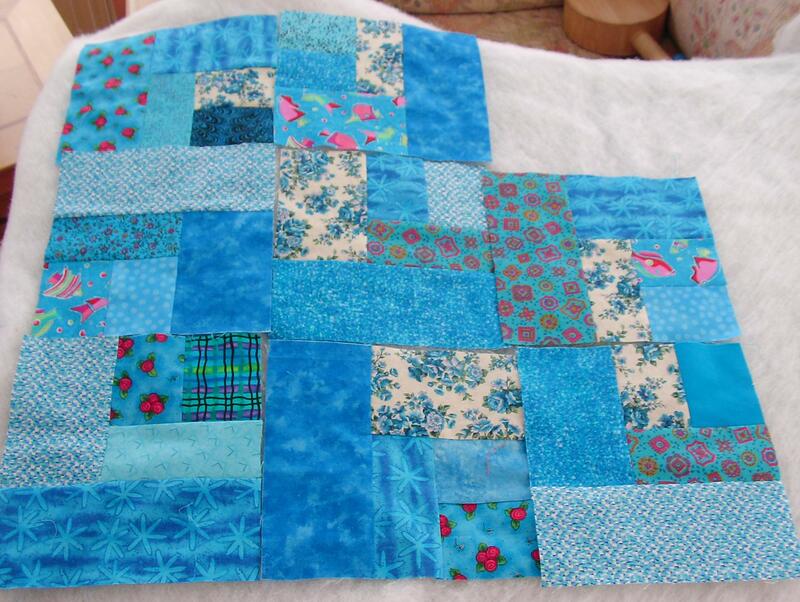 I’ve got eight little Turquoise scraps blocks stitched together now. They are just laid out here on my impromptu design wall. My sewing room is not “accessible” at the moment. 😉 Too messy! I’m downsizing a larger pattern (Note: Link updated 30-8-11) and discovered that my maths are wrong, so the blocks are not square. But that’s not hard to fix — I will square them up to 8.5 inches before assembling the quilt top. These are easy blocks to make. I’ve been sewing them in the kitchen while cooking and baking in preparation for Christmas festivities. I found some excellent and informative links today with historical background and instructions for Grandmother’s Flower Garden quilts and wanted to share with those quilters who would like to try this technique. It’s a great way to use up small pieces of scrap fabric. 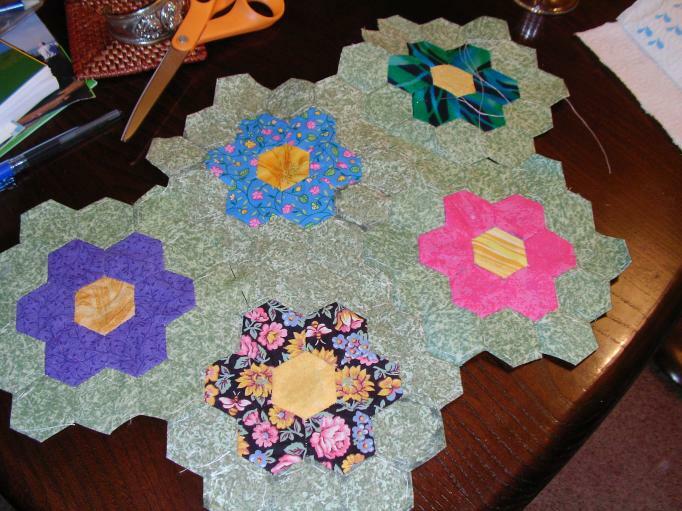 As shown in these links, there are several different methods of piecing this type of quilt — in individual flowers, as I did, or in complete rows as you go across. My quilt in progress: Grandmother’s Flower Garden.